So here’s the question for Premier Dalton McGuinty. Does he want to lose but live to fight another day? Or does he want to see his party crushed, pulverized and ground into chalk, as happened to the federal Conservatives in 1993? Maybe he does. Maybe scorched-earth syndrome is setting in. Increasingly, degrees of loss are the only avenues available to the Ontario Liberals. Another majority is not on. Nor is a minority, recent polls show. It’s all about triage — minimizing the scope of the disaster. McGuinty’s advisers must realize that an epic spanking is in the wind. One can argue that it’s always time for a change after two majorities — even when a government has been effective, responsible and responsive. Had there been no broken tax promises, no e-Health boondoggle, no lottery scandal and no Caledonia, Premier Dalton would still be dusting off his CV. It’s the way of politics, at least in Canada. After two terms of virtually unchecked power, ossification sets in. Purging is cyclical and to an extent, inevitable. Conservative leader Tim Hudak could wear flippers and a snorkel to the Legislature for the next year and he’d still be a safe bet to become premier. In McGuinty’s case this natural trend has been compounded. Ontarians were ready for a change in 2007. It was only the bungle by thenConservative leader John Tory over funding for religious schools that saved him. McGuinty must have thought to himself then: Where did I go right? Angels above, thank you for John Tory. Once re-elected, McGuinty promptly gifted the citizenry with a series of Daltonisms that have become famous, or infamous. Illicit activities such as smoking in cars, driving with even a trace of alcohol in your system, chewing gum — no wait, that’s Singapore — were banned. There’s no call yet for mandatory ice baths or hair shirts but these can’t be far off. But then it got even better, or worse, as the case may be. McGuinty foisted the Green Energy Act on rural Ontario. Dalton hasn’t spent much time in the outback. The few times he deigns to travel beyond the GTA he comes to speak, not listen. And it shows. 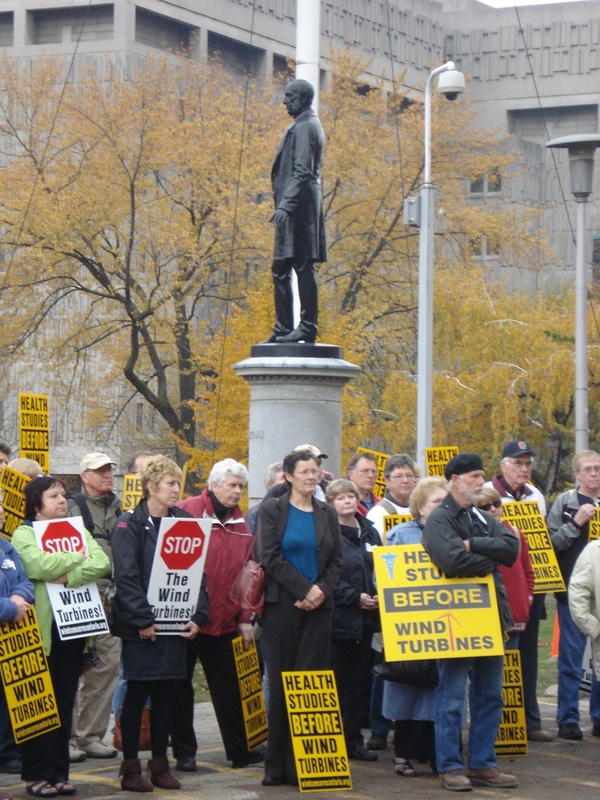 The gathering fury in rural Ontario over industrial wind turbines must be heard to be believed. It’s a quieter form of protest than you’d get in, say, France. But it’s no less potent. Just now, this week, another big industrial wind project has made news in Grey County, on the doorstep of the Niagara Escarpment. This may be the most pristine, pastoral countryside in all of Ontario. It’s an ecological treasure. Planning by a British-based wind corporation is well advanced. Local people haven’t been consulted. The first public meetings aren’t scheduled until mid-November. This is an area, keep in mind, where small landowners must obtain a permit for even the tiniest construction project, on account of the Niagara Escarpment being a world biosphere preserve. A forest of skyscraper-high concrete wind turbines is somewhat more intrusive than a tool shed, you might think. Queen’s Park, apparently, couldn’t care less. And all that was before the HST raised the price of haircuts, cab rides and sundry other goods and services that aren’t supposed to matter, and before electricity prices suddenly skyrocketed. A reasonable observer has to wonder: Is McGuinty working for Hudak? Either way, he’s done. The next 12 months will be a time for re-arranging deck chairs. Posted on October 29, 2010, in Green Energy Act, London Free Press. Bookmark the permalink. Leave a comment.